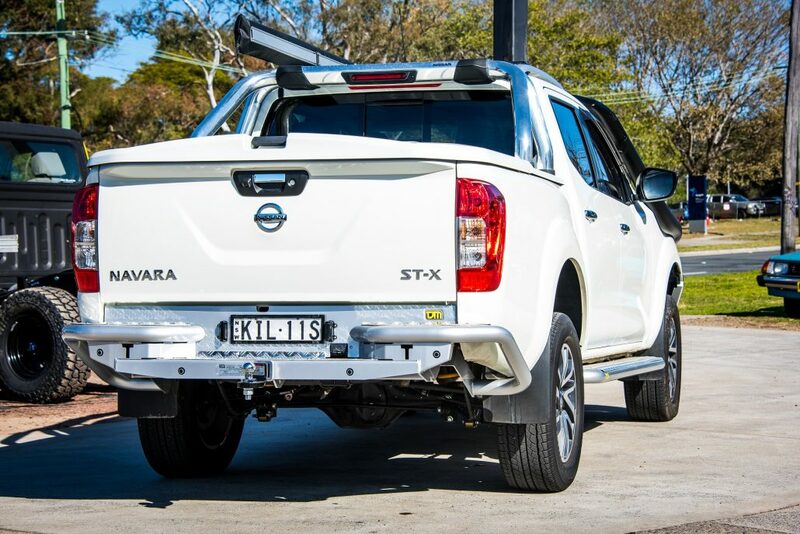 The dual cab ute market is without a doubt, the hottest contested market on the Australian 4WD scene at the moment. With the huge variety to pick from (which seems to be gaining new makes and models every year lately), it seems that the decision to buy one is the easiest in the process. 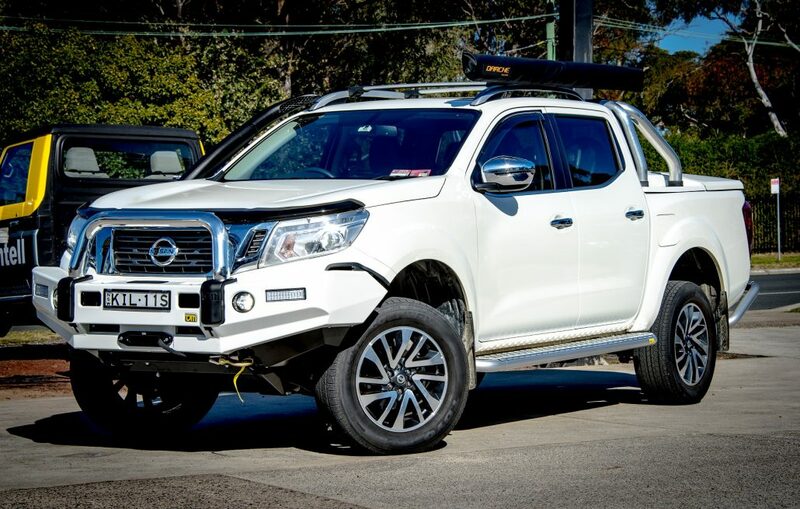 The Nissan NP300 Navara is just one of those contenders and while it’s not trumping all the tow tests (as you would expect from a vehicle with a coil sprung rear end), it certainly is offering something that no other manufacturer is currently offering (with the exception of Ford’s new Raptor Ranger). 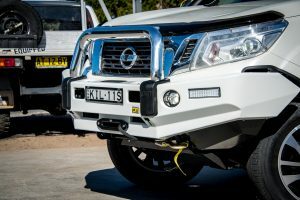 The coil spring rear end arrangement offers more ride refinement and better axle articulation/ travel than other leaf spring models on the market and for many punters these things are high on the list when it comes to buying a ute. After all – not everyone is looking to tow 3.5 tonnes every day of the week, so it’s no wonder the NP300 is gaining popularity fast. 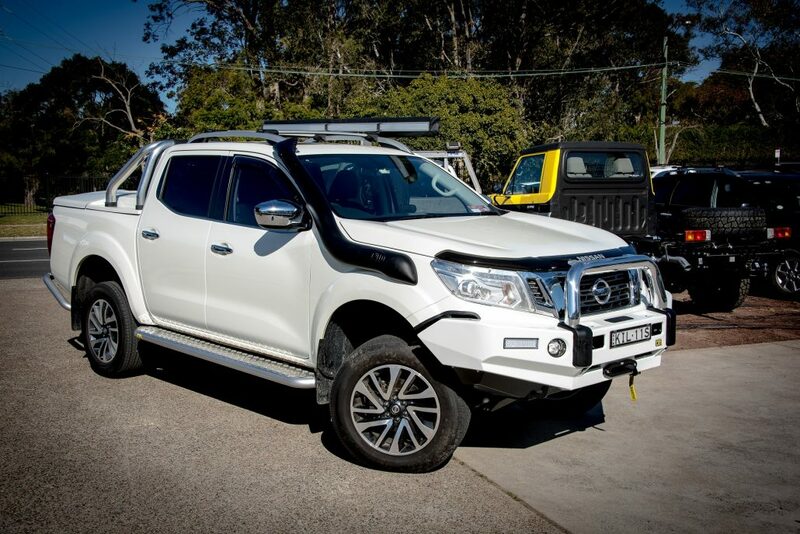 Our customers bought their Navara to us after eyeing the TJM bar work off on our website, with the idea of retaining the factory colour scheme while still gaining some protection for their Navara. 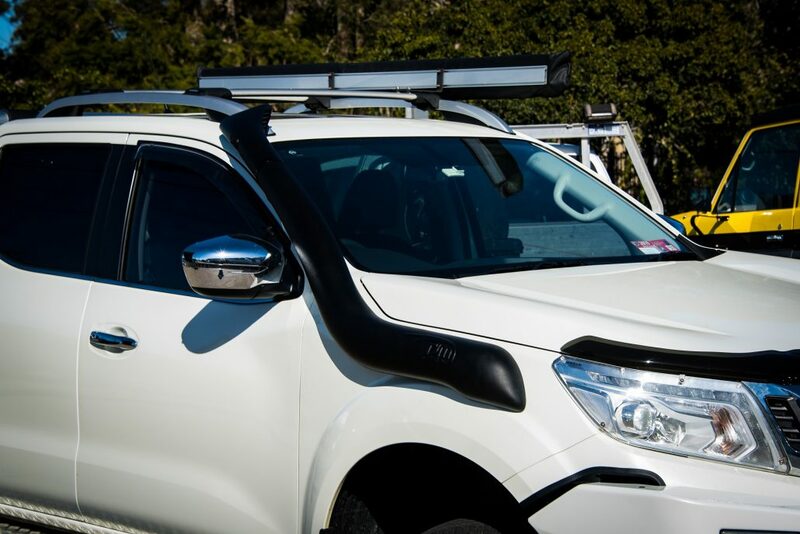 The T3 Explorer bull bar was fitted to the front of the Nissan and colour coded to factory white pearl colour. The bar houses a TJM Torq Black Edition winch which is a 9,500lbs unit with wireless remote, black synthetic rope and black accented hawse fairlead to take care of recovery duties. We also fitted a set of TJM heavy duty side steps and TJM RB6 Rear Bar which were colour coded to match the silver from the original factory steps and rear bumper thus retaining the factory look. 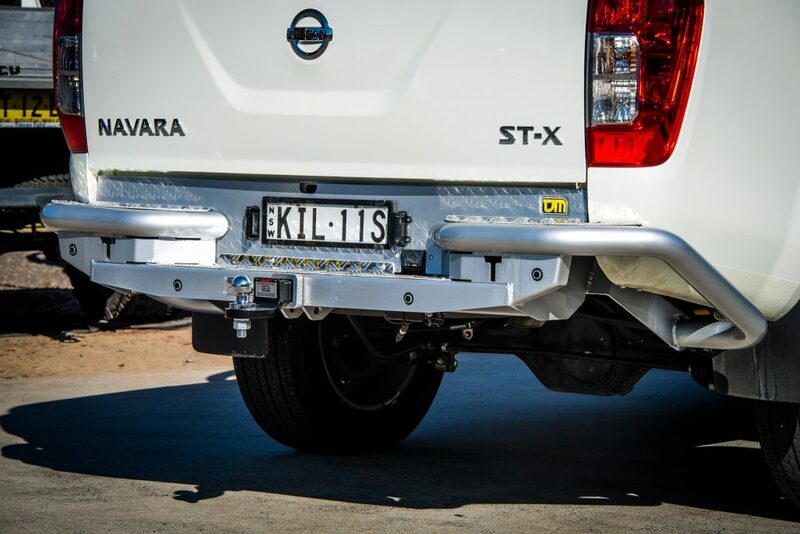 TJM underbody guards were fitted right through to the transmission and transfer case giving the Nav’s vital underbody components 3mm of heavy-duty steel protection. We also set about installing a TJM Airtec Snorkel to the NP300 for cooler, cleaner airflow to the intake. This particular one has the Wedgetail style head for a lower profile which keeps the snorkel head down and out of harms way. The whole towing issue is quite easily solved on the NP300 by upgrading the suspension and for this build we fitted the TJM suspension using the XJS Series 4000 shock absorbers which are 40mm twin tube gas shock. 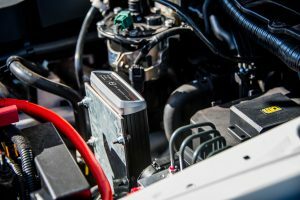 The coils were also upgraded to handle the additional weight on the front and towing duties at the rear, as well as giving the vehicle a bit more ground clearance and better angles for off-road work. 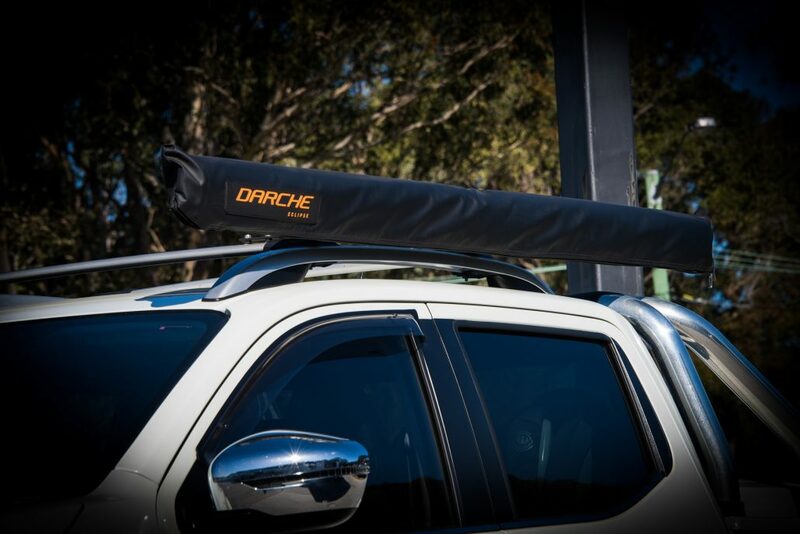 A Darche Eclipse 2 x 2.5m awning and roof racks were fitted previously by the owner and there is more work in the pipeline for this Navara including wheels, tyres and a dual battery system which has been partially installed. I’m sure we will see this NP300 out and about touring this great country of ours so keep your eyes out for it.